Have you heard our story about birds? than just vegetables can grow in her garden. We have something different for you! This is a guest post by Robert Lobitz of http://birdcages.net. He wanted to share some interesting facts and information about proper care for parrots. We love learning new things here at Night Light Stories. Thank you, Rob, for sharing your expertise! 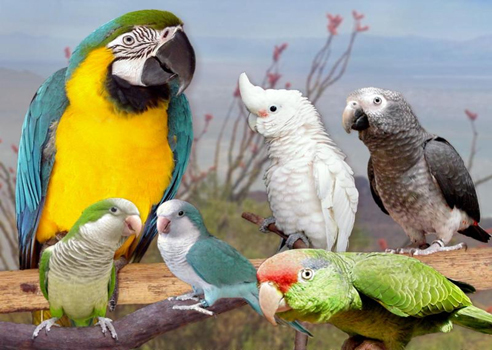 There are many types of parrots – over 300 total. If you remember Iago from Aladdin or Blu from Rio, then you have seen a parrot. The word “parrot” means a family of different types of birds such as cockatoos, amazons, and macaws. There are over 300 types of parrots in the world, mostly living in South America, Asia and Australia. You can tell the difference between parrots and other birds, like crows or woodpeckers by looking at them carefully. Most parrots have a thick, down-curved beak, stand straight up and have claws on their feet. Most parrots are vegetarians and only eat seeds, nuts, and fruit, while a few big parrots are omnivores and will eat seeds and also small animals like bugs and mice. Parrots can live very long, usually longer than dogs and cats. Small parrots usually live up to 20 years, while some types of parrots have been reported to live 80 to 100 years. 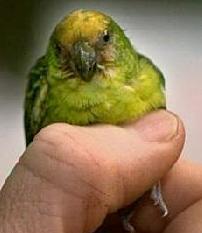 One of the smallest types of parrots is the Buff-faced Pygmy Parrot, which is around 3 inches tall, about half as tall as a pencil. One of the biggest types of parrots is the Hyacinth Macaw which is around 3 feet tall, about half as tall as a mop or broom. Would you like a parrot this big to sit on your shoulder? 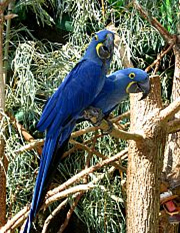 The Buff-faced Pygmy Parrot (left) and Hyacinth Macaw (right). See how they stand, how their beaks are curved and their claws? These are some ways you can see if the bird is in the parrot family. Some people love parrots for pets, other people think they are high maintenance and take too much work. Parrots, like Blu in the movie, can learn to love their owners and recognize them from other humans. But parrots need a lot of attention and care. Parrots need to be kept in a parrot bird cage to make sure they don’t fly away or get lost. In their cage they need toys, mirrors, food and water. Parrots are very curious and need to play, swing and peck at things all the time. A parrot bird cage should be at least twice the size of the bird’s wingspan. This means if you had two of the same parrot, put them side by side and told them to spread their wings as far as they can, the cage should be that tall and wide. It is important to plan where you want to put the cage. It should be away from windows, doors and drafts. It should be in a part of the home where people are a lot, because parrots love people, noise and movement. The parrot cage must be cleaned often and the owner has to make sure there is enough food and clean water all the time. vegetarian: An animal that only eats plant materials like seeds, fruits and nuts. omnivore: An animal that eats plant materials but also meat. maintenance: To take care of something very carefully. 1. There are how many types of parrots in the world? A) less than 10 B) over 300 C) over 1000 D) Only one type. 2. What are two reasons parrots would make good pets? 3. What are two reasons people might not want a parrot as a pet? 4. What are at least 3 things parrots need in their cages and why? 5. If you were in charge of a parrot cage, what are 3 things you would have to make sure of? As always, we look forward to the many facts we can share together.